Today’s incontinence sufferers are not’t just the elderly persons in an adult care facility. Outside of aging, diabetes, pregnancy, childbirth, menopause and prostate conditions are among just some of the factors that contribute to incontinence problems among millions of people who still have active lifestyles. Together with the right protection they can keep doing all of the activities they love. 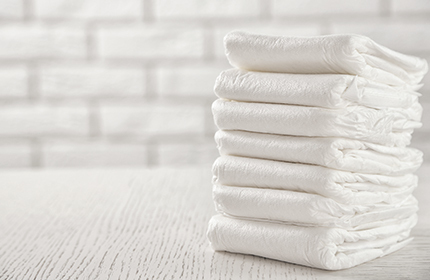 In this purpose ASNONWOVENS high-loft multilayer ADL which is developed with Airthrough Bonded technology, is designed to be used as a complex engineered fabric to provide superior fluid acquisition and excellent distribution with a consistent quality in order to increase the absorbent core performance of adult diapers. The structure of ASNONWOVENS Multilayer ADL has developped to gain comfort, soft and dry feel with an excellent fluid management.